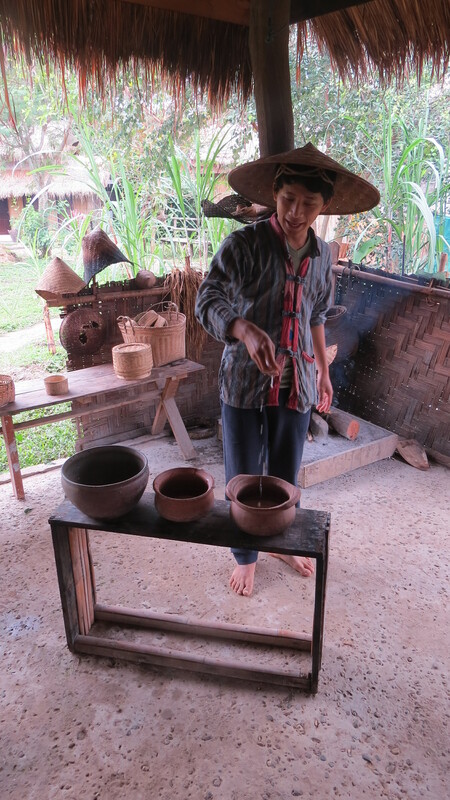 We had heard that Laos was a favorite for many visitors to SE Asia, and we understood why having stayed just briefly in this landlocked country. In Luang Prabang, a UNESCO World Heritage city located in northern Laos, we had our first experience of meeting fellow travelers. After whipping through two cities in two countries in six days, Laos began our slow-down traveling. But, it’s also here we began a diverse group of daily tours, one of the most interesting being a half-day of learning about rice agriculture. 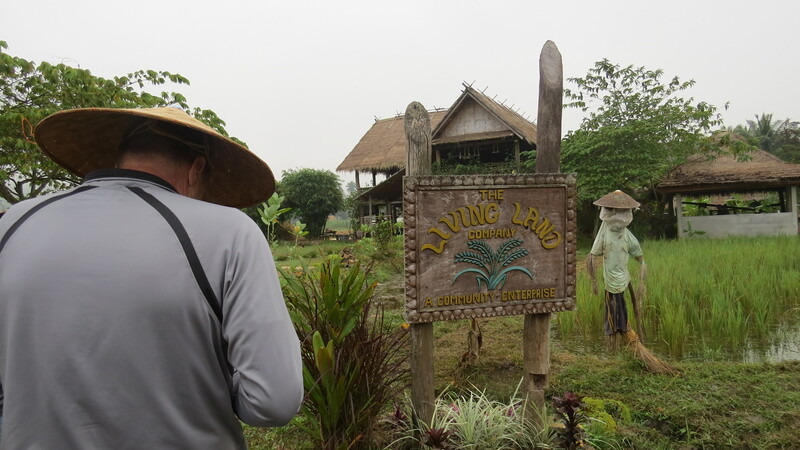 The Living Land Farm was formed by two brothers, Laut and Si Lee, as a community enterprise suppling organic produce to local area restaurants. 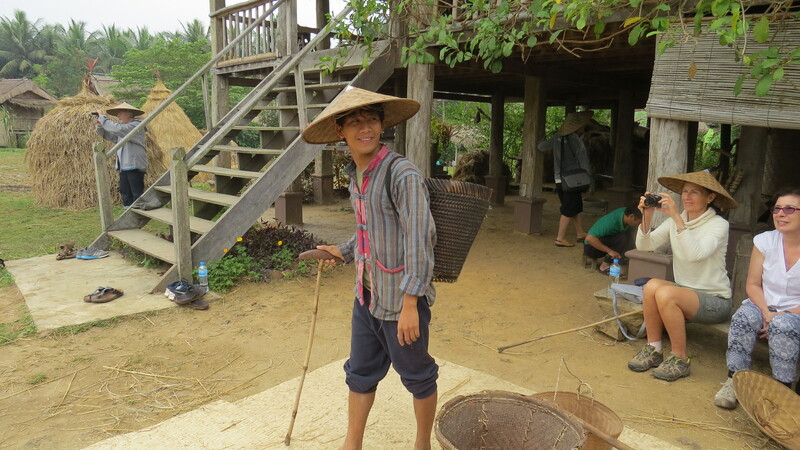 Employing Laotians who lack higher education and/or are from remote tribal areas, the farm grows chemical-free crops using traditional methods including their own hand-made tools. 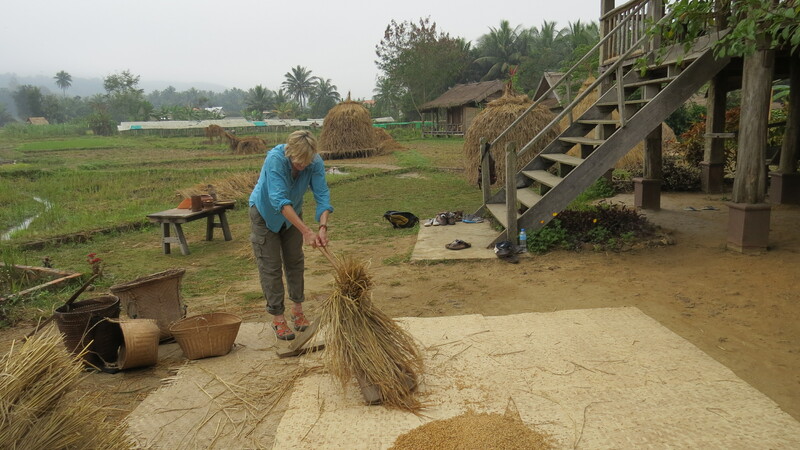 Our half-day rice tour provided a glimpse into this activity similar to one of those films where months are collapsed into minutes. 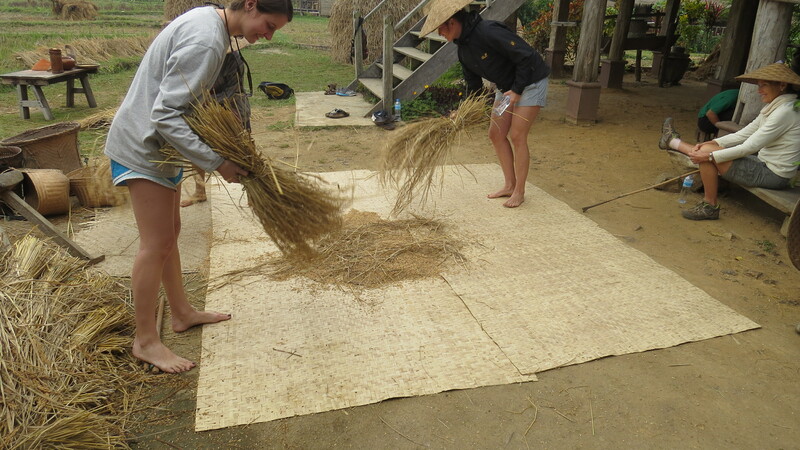 To actually experience rice from seed to table was amazing, primarily because I’m so removed from agriculture. And, to literally see brown husks transform into the kernels I purchase in the store was magical. 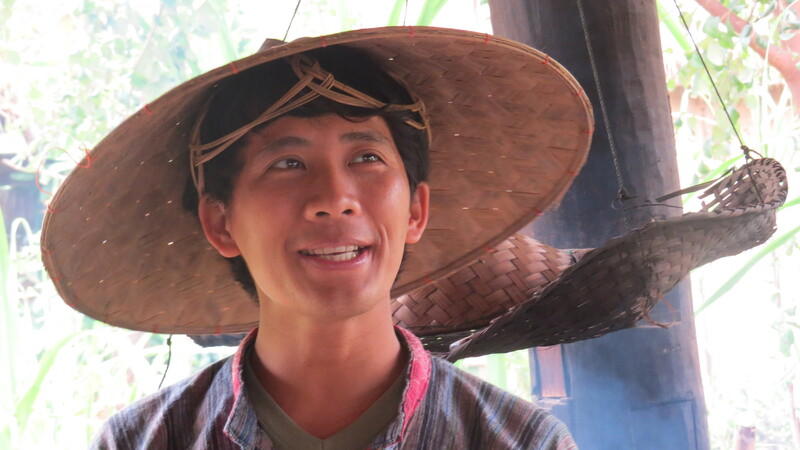 One of the co-founding brothers was our guide, an excellent and exuberant teacher who told us just to call him ‘Lee’ since he obviously realized most foreigners butcher the pronunciation of his first name, ‘Laut’. 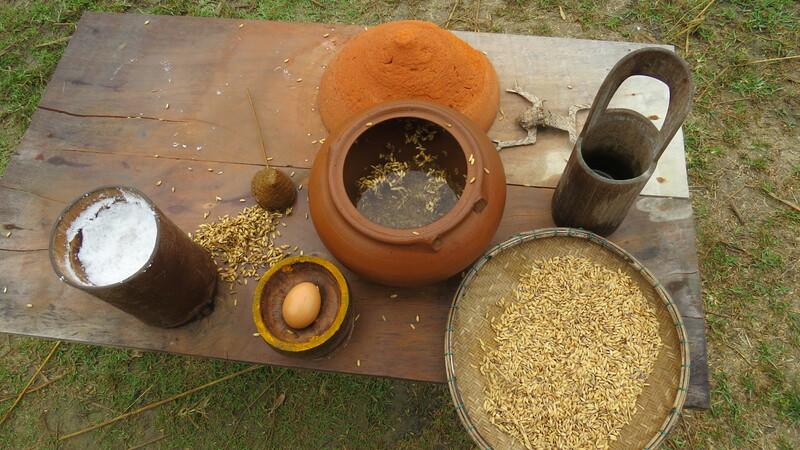 Lee demonstrated the traditional seed selection method using an egg, salt, and pail of water. 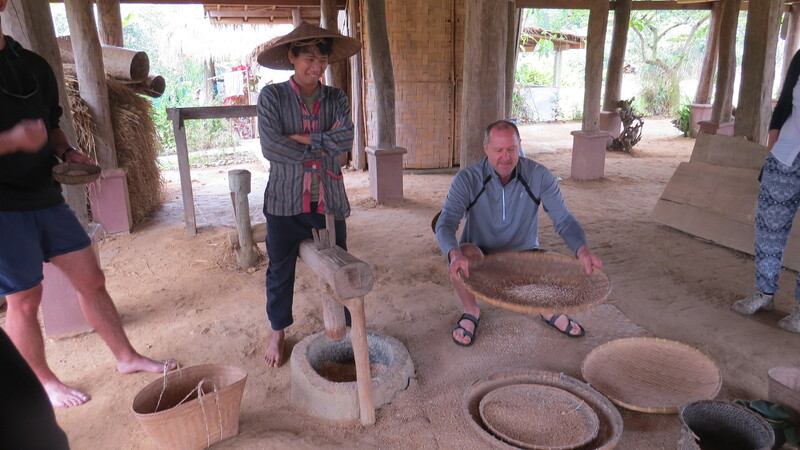 Tossing in salt until the egg began to float, thereby achieving the proper water density, Lee then poured some grains of rice from a previous year’s harvest into the pail. Those that floated like the egg would be used for feed while the heavier ones would sink. The latter are denser and filled with healthy matter, not just air. 2. Next, seeds are placed on wet mud where they germinate after 3-6 days. 3. 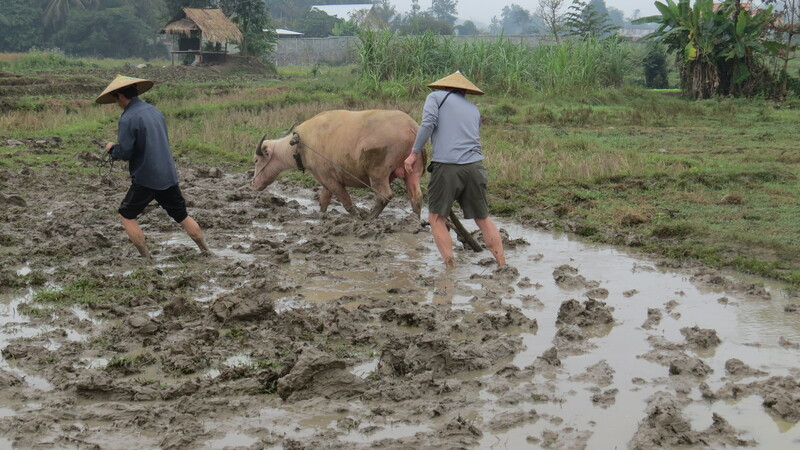 We moved to irrigated paddies where we tried our hand at tilling with Rudolph, one of the farm’s water buffalos. (You may recognize the guy behind the plow.) During plowing, the previous crop’s detritus is plowed into the soil to provide nutrients. 4. Then accompanied by Lee’s lilting song we planted seedlings. 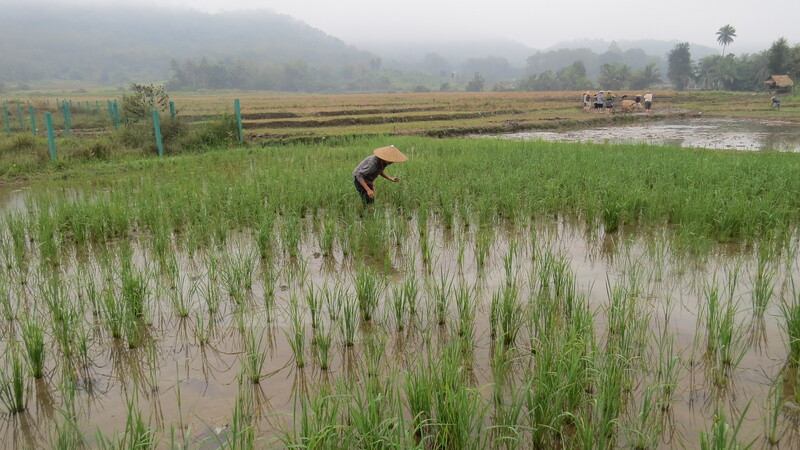 The field is kept flooded with water in order to help prevent weeds from growing (but not so deep as to cover the the rice shoots). 5. The paddies are weeded, including picking snails to keep them from eating the crop. 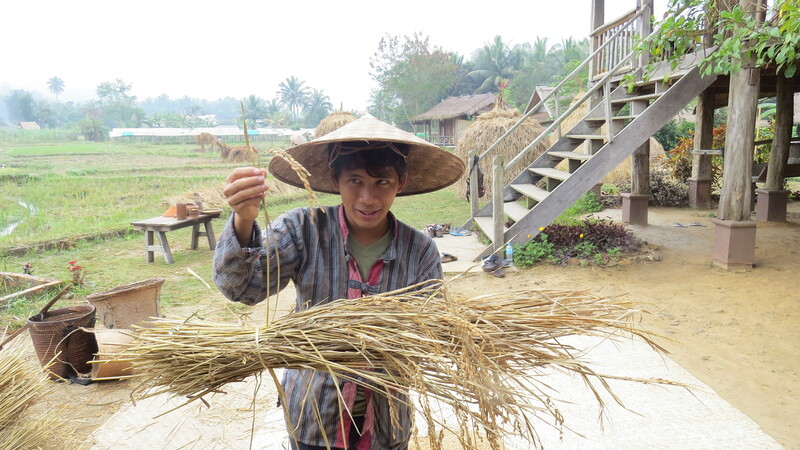 Northern Laos (where we were) generally has one rice crop a year while southern Laos’ rainier and hotter climate allows for two crops. 6. After about 10 weeks the paddies are drained and the stalks, heavy with ripe grain, are cut with a sickle then left to dry in the sun. 7. After 4 days or more the green stalks have dried to straw-colored branches. We then tried our hands at thrashing them to flush out the individual grains. This entailed repeatedly hitting a bunch of stalks against a slanted board forcing the grains to scatter across the ground. 8. To remove stray bits of debris from the thrashing the grain is fanned then swept into piles. 10. 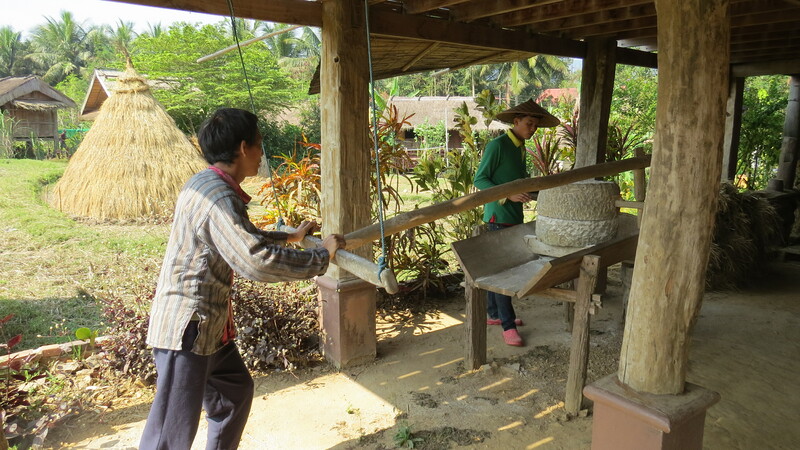 To extract the kernel from the thrashed grain a foot-powered sledgehammer is used for husking. 11. 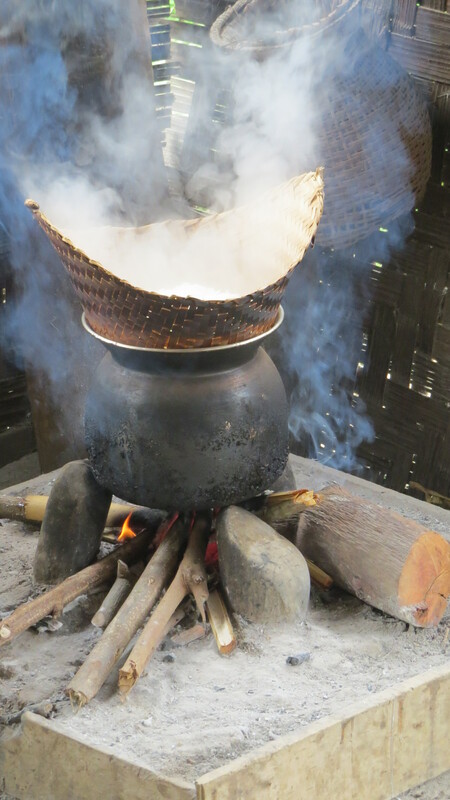 To finalize the separation of kernel from husk, we tossed the wicker tray resulting in billowing beige husks wafting from the creamy rice kernels. 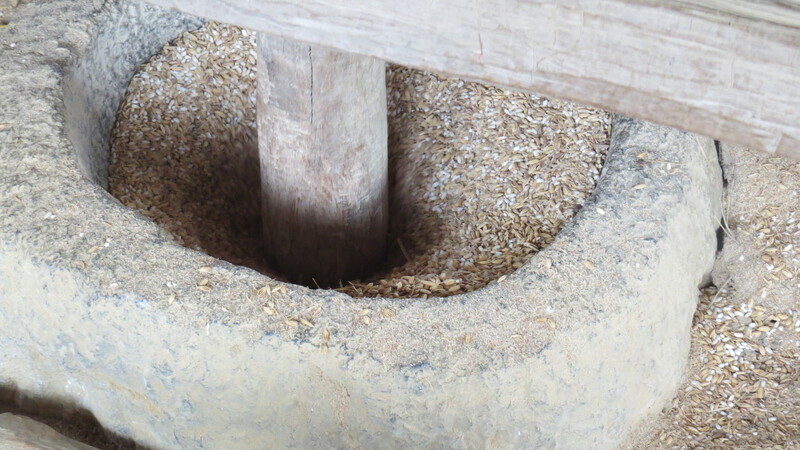 Out of this winnowing process any broken kernels are milled into rice flour using a granite grinder. Lee’s movements were so graceful and rhythmic watching him was akin to viewing a ballet. We all tried to mimic his actions but couldn’t even come close to his style. Think Mikhail Baryshnikov to Bullwinkle and you’ll get the picture. then steamed over a charcoal fire. 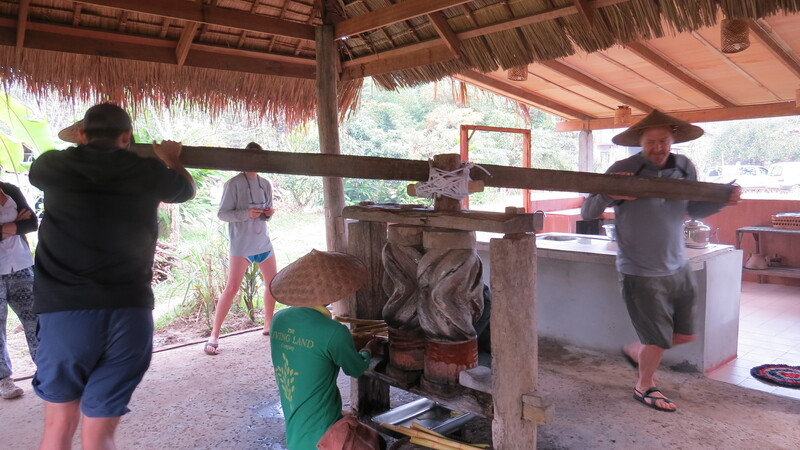 As we watched we sipped fresh sugar cane juice extracted using a beautifully carved rosewood mill, still in use after 100 years. 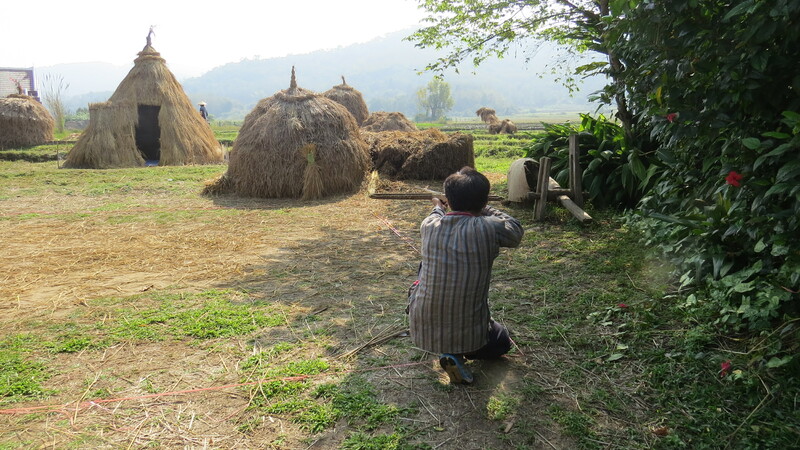 While waiting our final step we tried our hand at shooting arrows at a bulls eye. 14. The end of our tour was a repast of various rice items including a potent saki that was surprisingly smooth in spite of smelling like nail polish remover. I don’t think I’ll ever be able to eat a spoonful of rice without remembering the ballet Lee danced. His tutoring represented one of the richest learning experiences I’ve had in awhile. Rice ballet is definitely worth savoring. 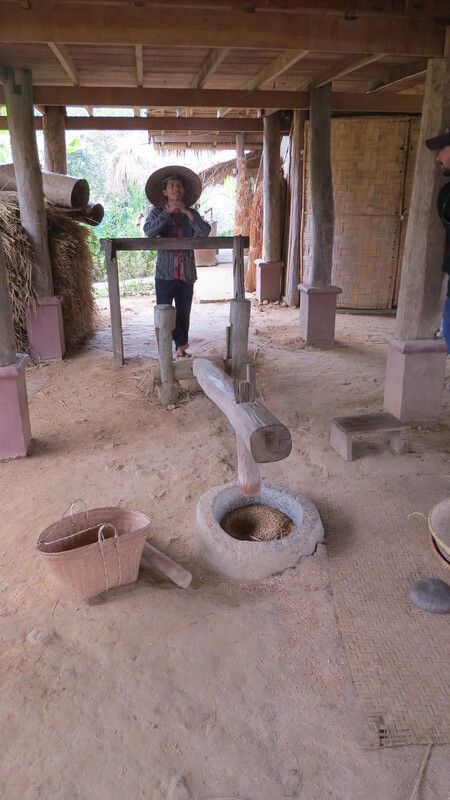 This entry was posted in 2016 02 SE ASIA - Laos, 2016 Winter Tours, Asia, COUNTRY, Laos, WINTER TOURS on March 3, 2016 by margaretlynnie.